We all know exams can be a stressful time for students, so at UNB's Fredericton and Saint John campuses, groups have thought up unique ways to help students cope during this exam period. UNB has a number of ongoing services available to students such as counseling services, writing and math help centres, quiet study space, etc., but this year, there are other initiatives that are drawing quite a bit of student attention. 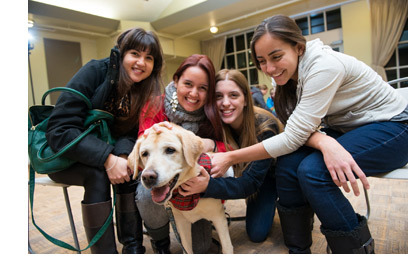 UNB Fredericton will be holding a dog therapy session on Wednesday, April 17, from 6:30-8:00 p.m. at the Student Union Building Ballroom. There is also a free relaxation yoga class being offered at the Currie Center. Residences are under 23-hour-day quiet time during exams, so during the one-hour each day when this is not enforced, many residence proctors and dons are doing things to help students relax. For example, the Lady Beaverbrook Residence Don, Linda O’Brien, prepares fresh-baked goods for the students in her residence each day to give them a break from the books. UNB Saint John also held a dog therapy session last week and brought in massage therapists who offered free massages to students when exams were getting underway. They also brought in a dietitian to host a food information session, where students were provided with eating tips and lists of foods that are known to reduce stress. These are just a sample of the initiatives being offered by various faculty and staff at UNB to make exam time a little easier on students.